In a 9x13 inch baking dish, arrange the yam rounds. Set aside. In a small saucepan over medium heat, add the panocha, anise stars, cinnamon stick, water, orange juice and cloves. Stir liquid for panocha to fully melt. Lower flame and simmer for 15 minutes. Pour liquid mixture over yams. Make sure the spices are all in the liquid and not sitting on top of the yams. Take the yams out of the oven and remove anise stars, cinnamon stick and cloves. 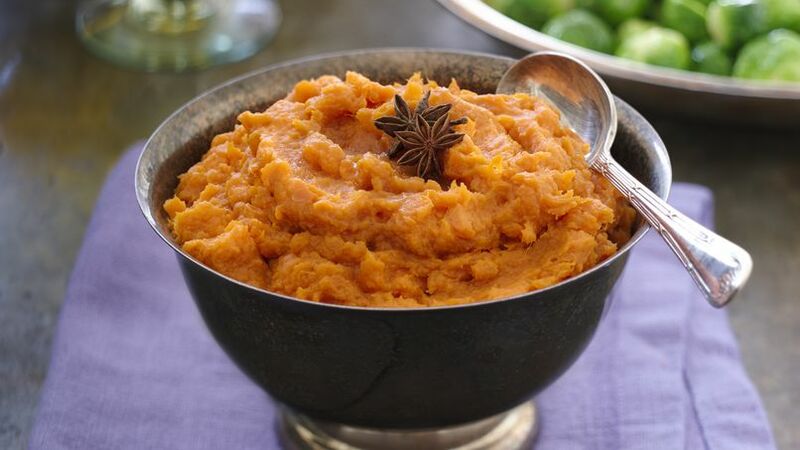 Remove the yams from the liquid and place in a large bowl. Mash with a potato masher until creamy. Add butter and mix to combine. Serve warm. Stirring the yams halfway through during baking will coat them in the sweet sauce and let them slightly boil while baking. This will make the yams super soft for mashing. If you want to add an extra sweetness to your camote, add a few tablespoons of the liquid the yams baked in. A holiday table just wouldn't be complete without a big serving of sweet camote. The subtle sweetness is the perfect pairing for savory dishes and balances the meal ideally. Some people love camote and can't live without it, and others would rather take a pass. This smashed camote recipe pleases camote lovers and turns others into believers. Try it this holiday season!